What Was Your Favorite April Fools’ Prank of the Day? I actually thought yesterday was April 1 for half of the day, making today feel anticlimactic. I honestly couldn’t think of a prank post to write last night, so I went to bed blogless. I woke up to a customer service issue that put a bit of damper on the day. My parents were in town this weekend and for the first half of today, which we spent reorganizing, improving, and cleaning my condo. I was just really busy for the rest of the day. Someone (or several people) kept trying to add me to the Modern Cat e-newsletter. What was your favorite prank of the day, whether it was a corporate prank you saw online or one you experienced firsthand? This entry was posted on Monday, April 1st, 2019 at 7:50 pm	and is filed under April Fools. You can follow any responses to this entry through the RSS 2.0 feed. Someone left a box of doughnuts in the breakroom. Open it up and BAM broccoli. The kicker was that they left half of an actual doughnut right next to the box. Not laugh out loud, more subtle and clever ( the intro sentence by The NY Times I feel is unnecessary and takes the surprise away). And my favorite April Fools prank is the classic BBC Spaghetti Harvest Shortage which caused a run on pasta throughout the U.K.
One of: https://twitter.com/canyoupetthedog answering the question for various cats, while referring to them as dogs, or Hal Labs characters Kirby and Qbby swapping shapes, so kirby was a cube (https://www.kirby.jp/squarekirby/) and qbby was a circle (https://twitter.com/Hakoboy_HAL/status/1112370524133310464). Los Angeles Rams coach Sean McVay welcomed his friend Kliff Kingsbury to the NFL coaching ranks by trying to trick the Arizona Cardinals coach into thinking he would lose draft picks by tampering with Patrick Mahomes. McVay shared the story of his prank on Kingsbury on The Adam Schefter Podcast, which was posted on Monday. He said he pulled the prank at a dinner he attended with Kingsbury and Mahomes, the Kansas City Chiefs quarterback with whom Kingsbury has a personal relationship. That’s awesome. 🙂 Very clever to change the name in his phone! This is one of my greatest achievements because I got you! 😀 I’m still giggling about this. 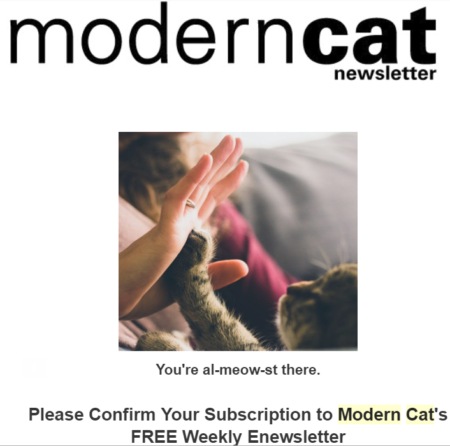 Modern Cat weekly for all!